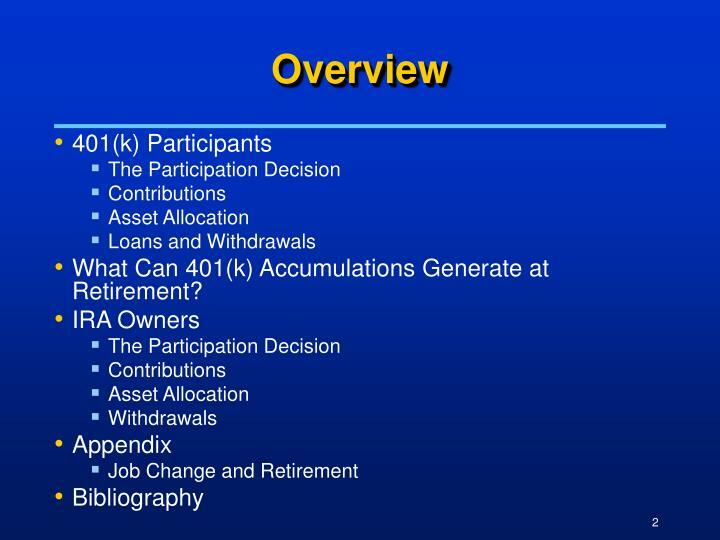 What Can 401(k) Accumulations Generate at Retirement? 2Multiple responses included. Number of respondents varies. 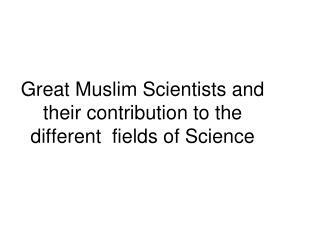 3Asked of those offered the feature. 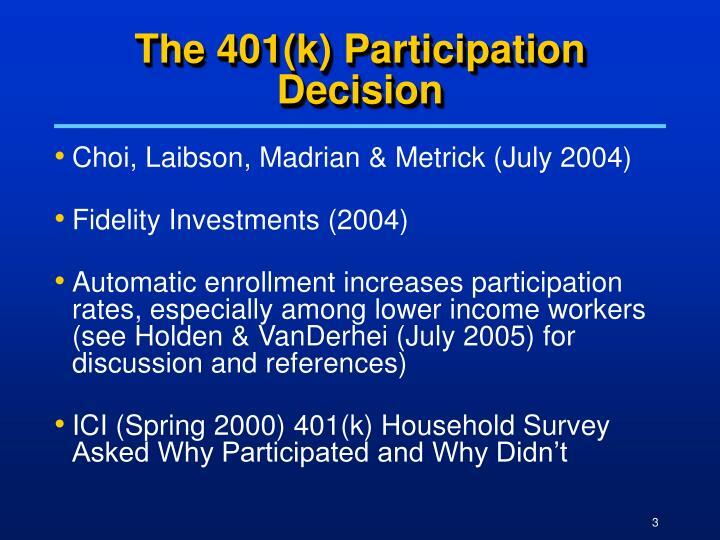 1Percent of 401(k) plan non-participants indicating reason was “very” or “somewhat” important. Analyze account balances, asset allocation, and loan activity in annual updates. 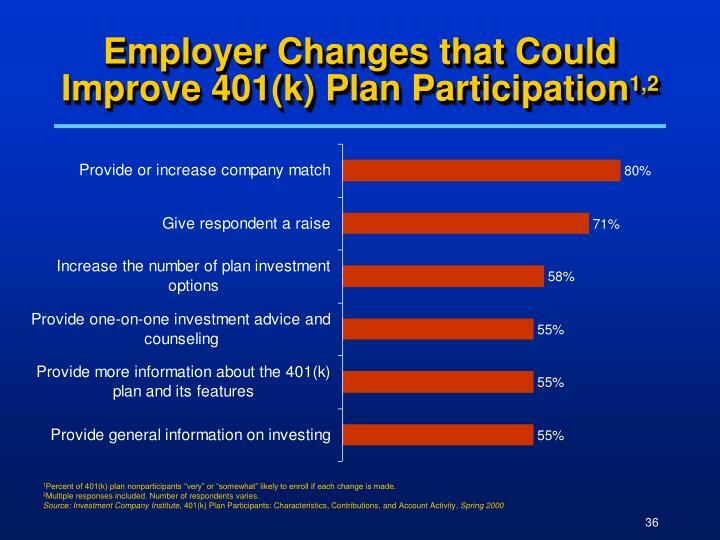 What influences 401(k) plan participants’ contribution activity? 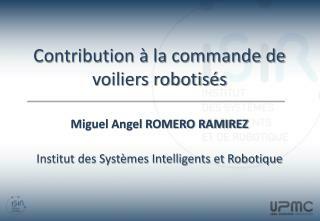 1Percent of participants in salary range. 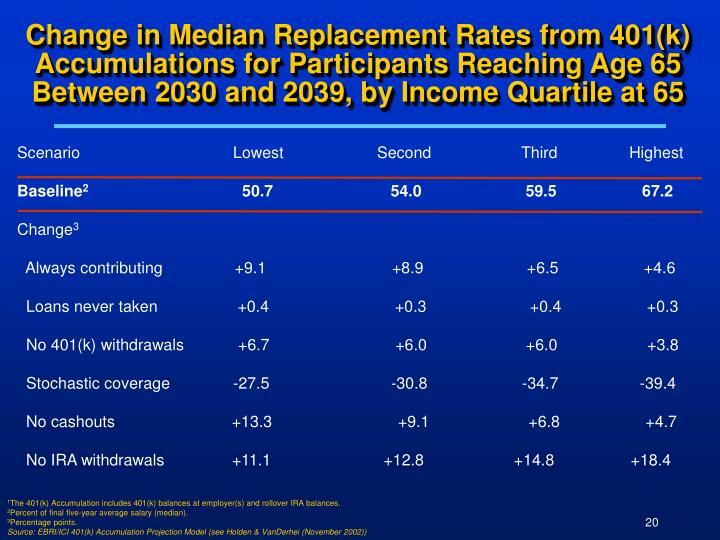 2Excludes participants earning less than $40,000 a year because another IRC limit prevented them from reaching the §402(g) limit. Tabulated from a sample of 0.8 million participants. 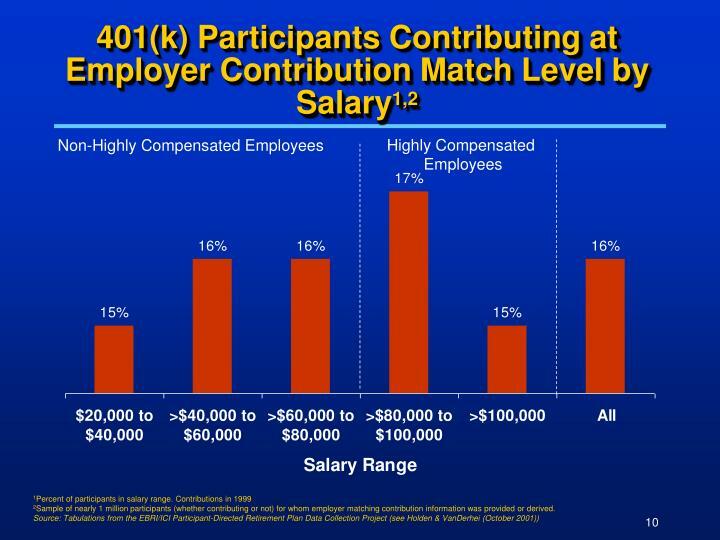 2Sample of nearly 1 million participants (whether contributing or not) for whom employer matching contribution information was provided or derived. 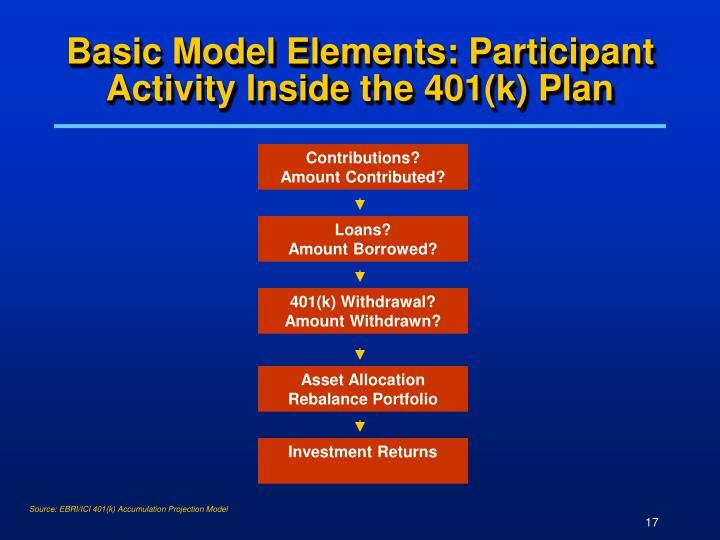 What influences 401(k) plan participants’ asset allocations? 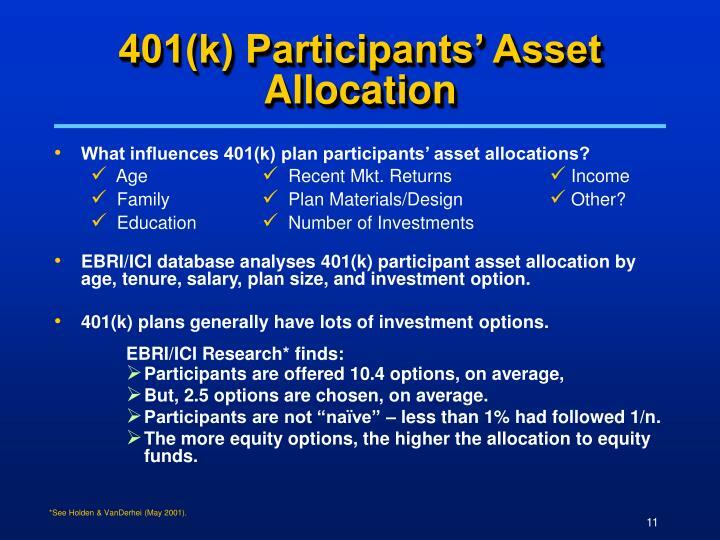 EBRI/ICI database analyses 401(k) participant asset allocation by age, tenure, salary, plan size, and investment option. 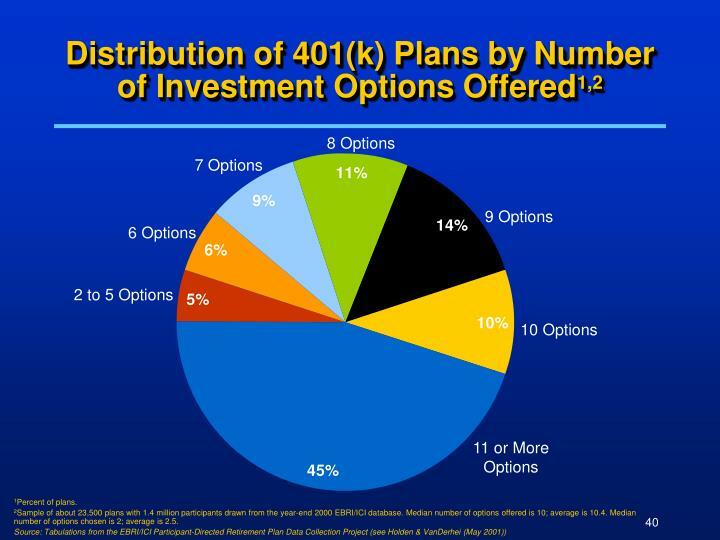 401(k) plans generally have lots of investment options. But, 2.5 options are chosen, on average. 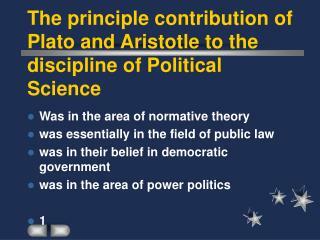 Participants are not “naïve” – less than 1% had followed 1/n. The more equity options, the higher the allocation to equity funds. *See Holden & VanDerhei (May 2001). 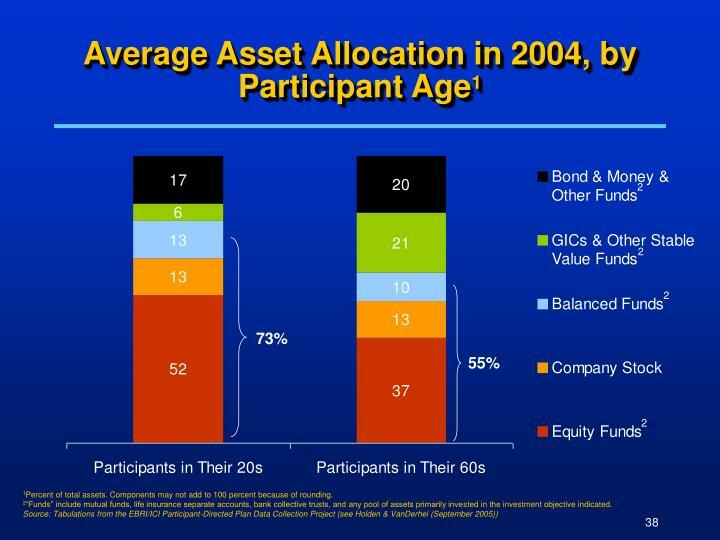 1401(k) plan average asset allocation among participants with two or fewer years of tenure, percent of total. Minor investment options are not shown; therefore, column percentages do not add to 100 percent. 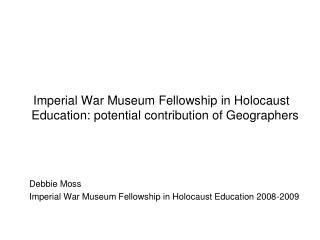 2Drawn from samples of 1.2 million participants with two or fewer years of tenure in 1998 and 1.8 million participants with two or fewer years of tenure in 2004. 3Fixed-Income investments include bond funds, guaranteed investment contracts (GICs) and other stable value funds, and money funds. 4“Funds” include mutual funds, bank collective trusts, life insurance separate accounts, and any pooled investment product primarily invested in the security indicated. 5Balanced funds include lifestyle and lifecycle funds. 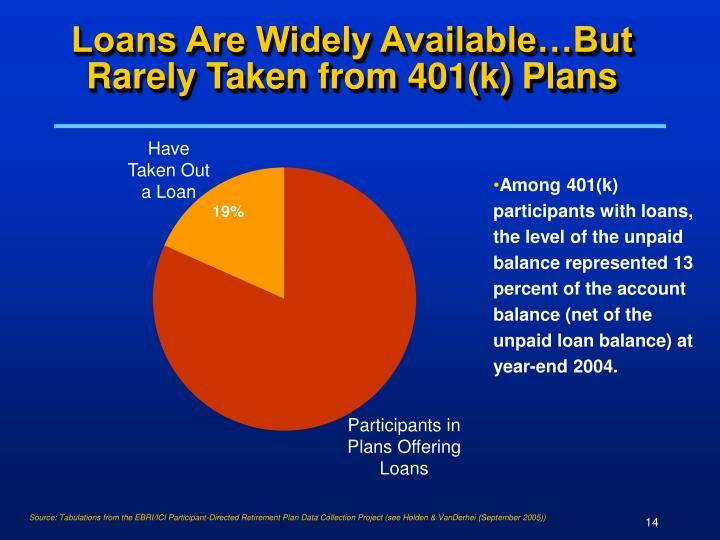 Among 401(k) participants with loans, the level of the unpaid balance represented 13 percent of the account balance (net of the unpaid loan balance) at year-end 2004. 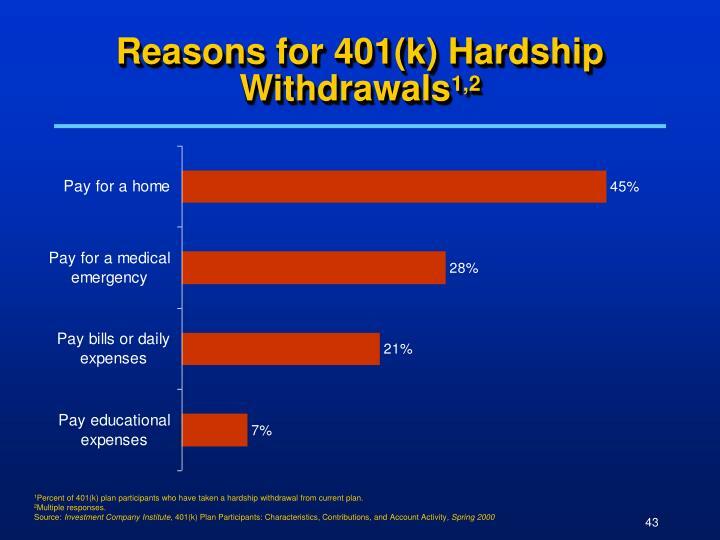 *Percent of 401(k) participants whose plans allow hardship withdrawals. Leave Balance, Cash Out, or Roll Over? 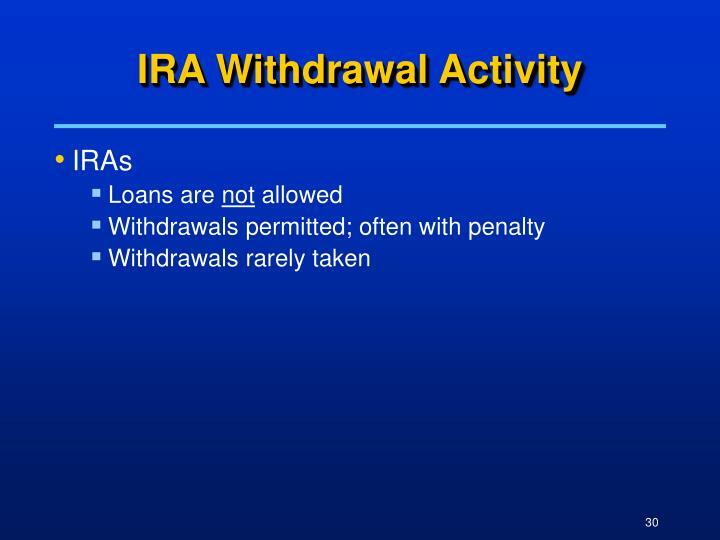 Rollover IRA?Asset Allocation, Investment Returns, IRA Withdrawals? 1Percent of final five-year average salary. 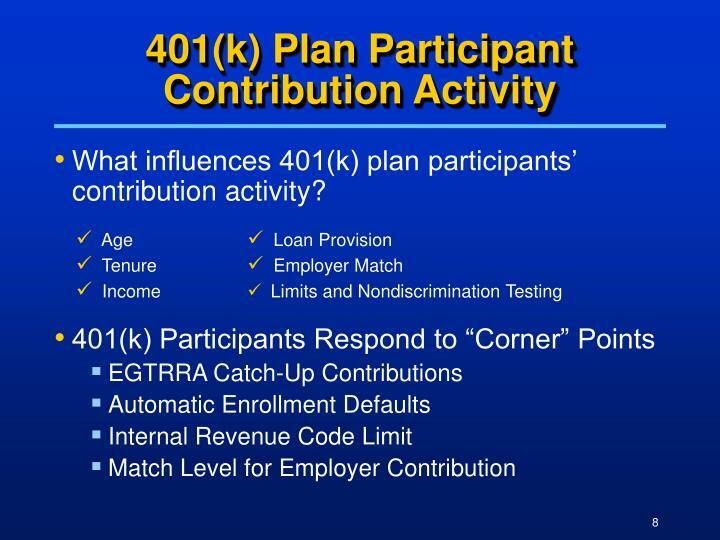 2The 401(k) accumulation includes 401(k) balances at employer(s) and rollover IRA balances. 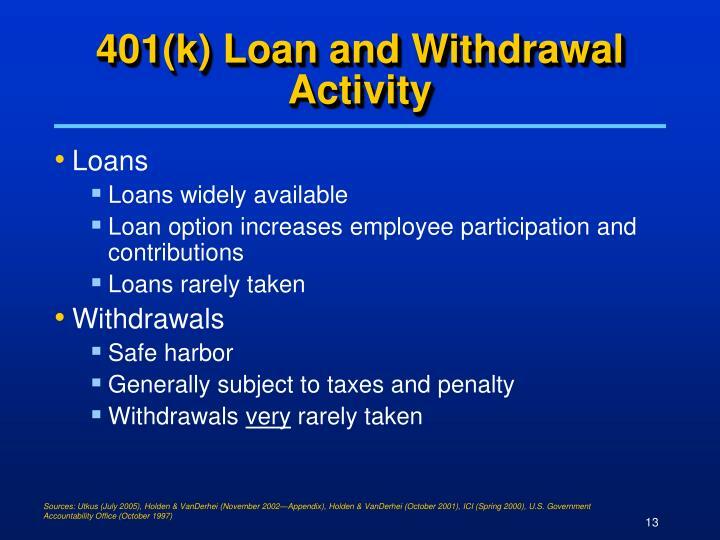 1The 401(k) Accumulation includes 401(k) balances at employer(s) and rollover IRA balances. 2Percent of final five-year average salary (median). 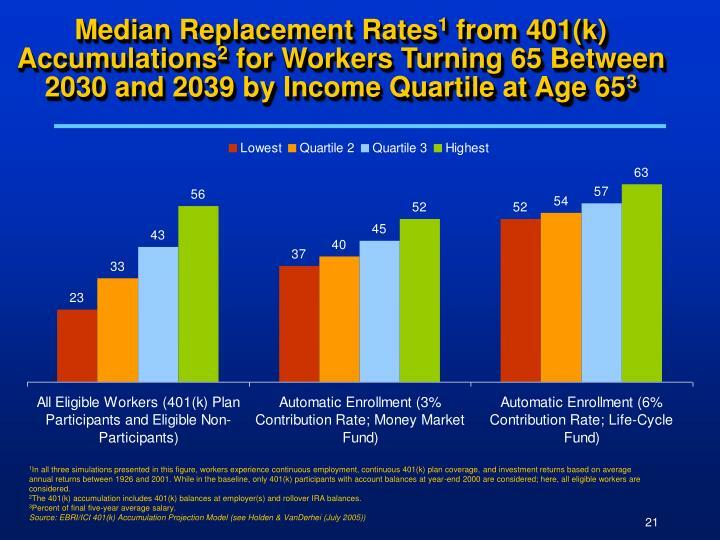 1In all three simulations presented in this figure, workers experience continuous employment, continuous 401(k) plan coverage, and investment returns based on average annual returns between 1926 and 2001. 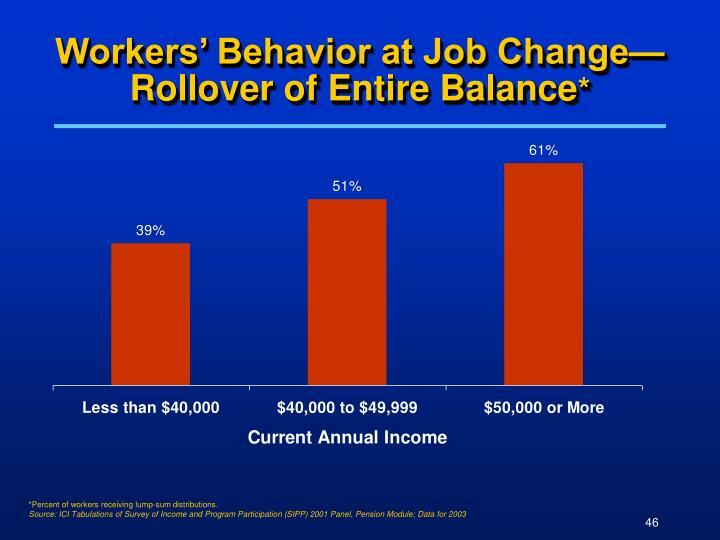 While in the baseline, only 401(k) participants with account balances at year-end 2000 are considered; here, all eligible workers are considered. 3Percent of final five-year average salary. 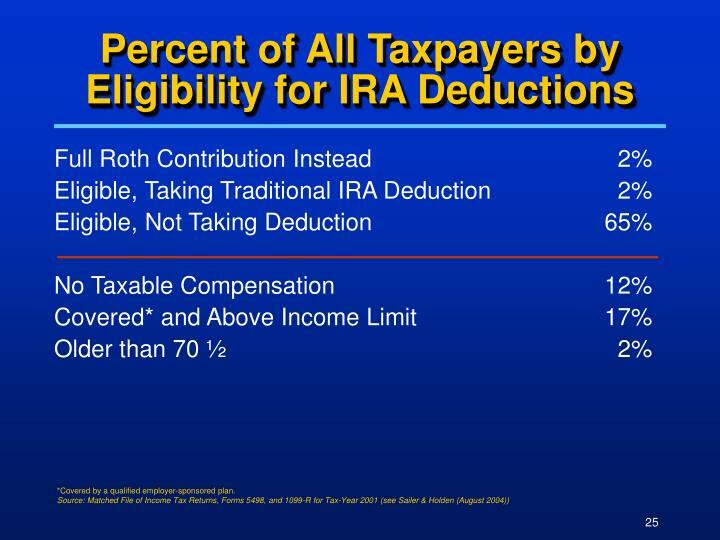 *Deductible IRA contributions reported on individual income tax returns (Form 1040). *Covered by a qualified employer-sponsored plan. 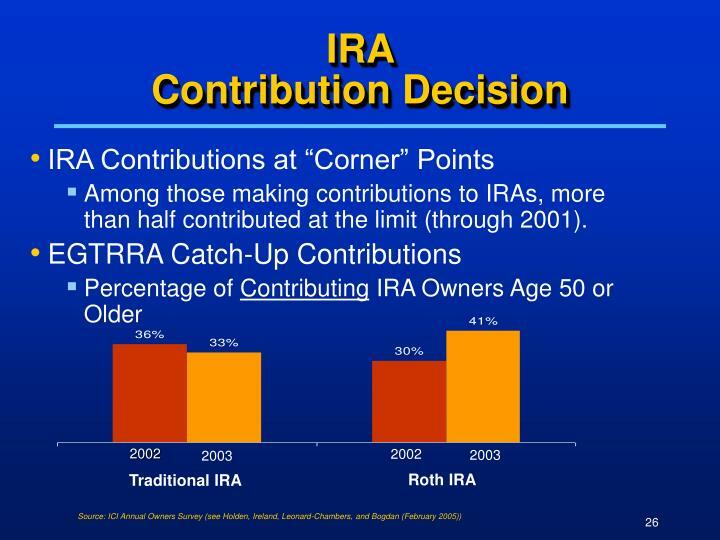 Among those making contributions to IRAs, more than half contributed at the limit (through 2001). 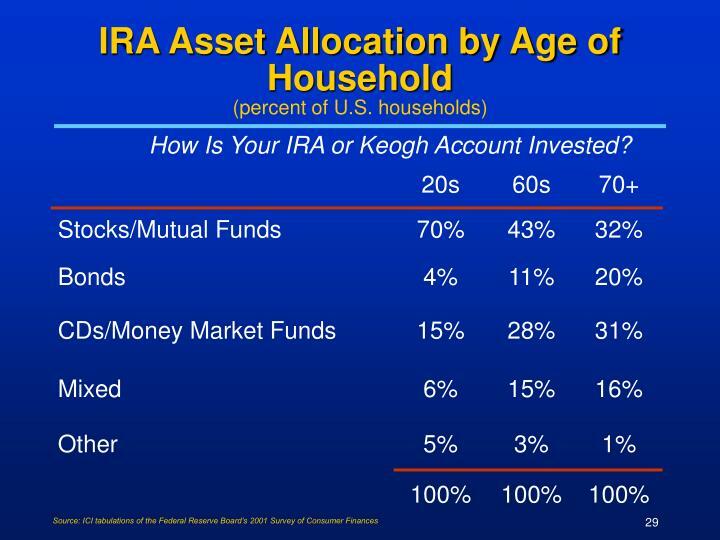 IRA asset allocation varies with age. 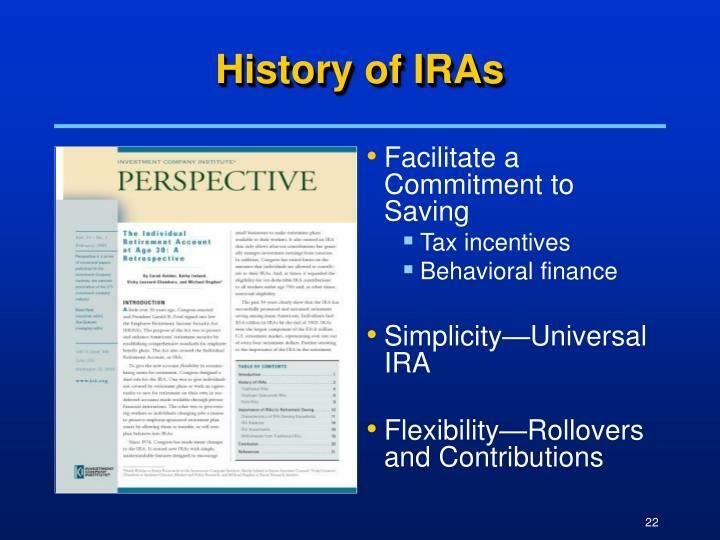 In 2004, 46 percent of households with traditional IRAs had rollovers in their IRAs (ICI (February 2005)). 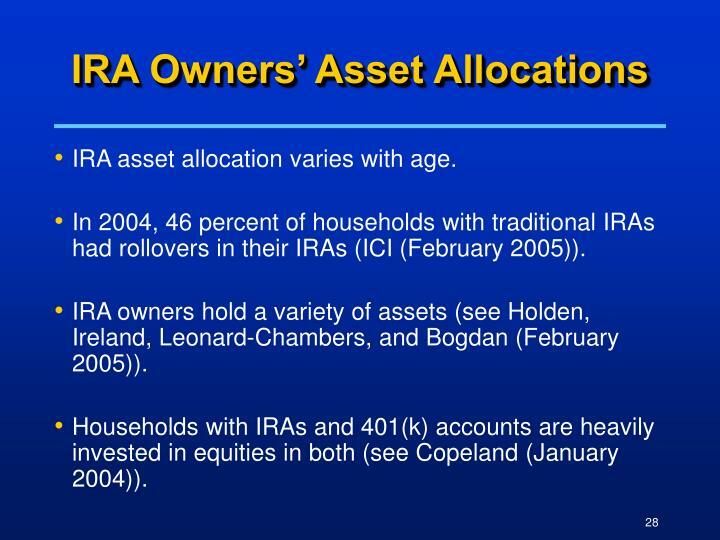 IRA owners hold a variety of assets (see Holden, Ireland, Leonard-Chambers, and Bogdan (February 2005)). 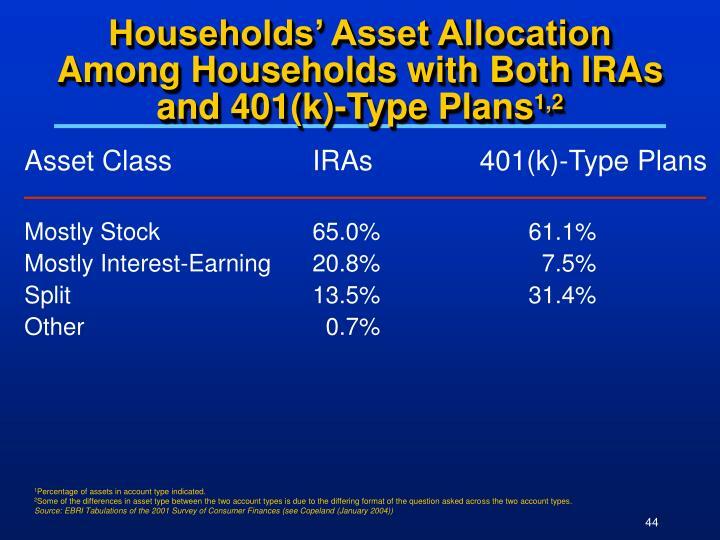 Households with IRAs and 401(k) accounts are heavily invested in equities in both (see Copeland (January 2004)). How Is Your IRA or Keogh Account Invested? 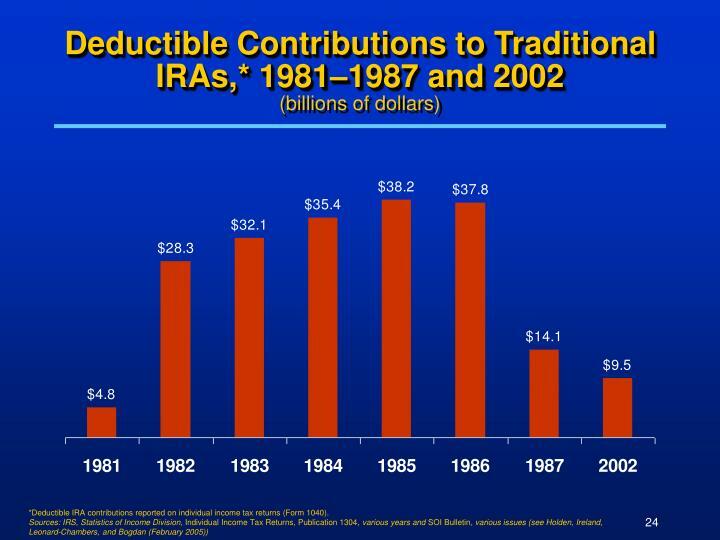 *Percent of households with traditional IRAs. Withdrawal activity in any given year on average between 1999 and 2003. 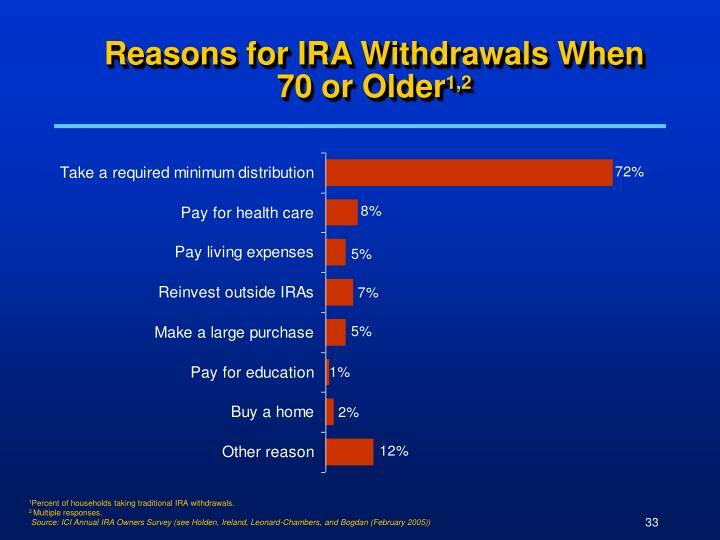 1Percent of households taking traditional IRA withdrawals. 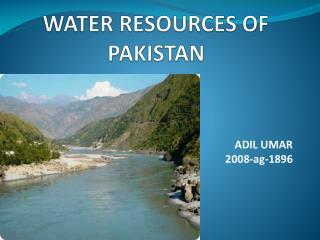 Results pooled over 2000 through 2004 survey years covering withdrawal activity in 1999 to 2003. 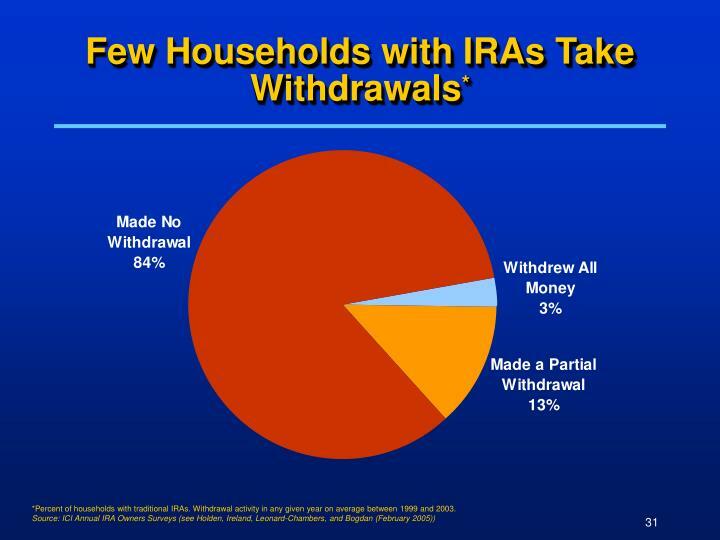 1Percent of households taking traditional IRA withdrawals. 1Components do not add to total because of rounding. 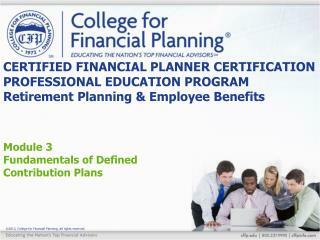 2Includes private employer-sponsored defined contribution plans, 403(b) plans, and 457 plans. 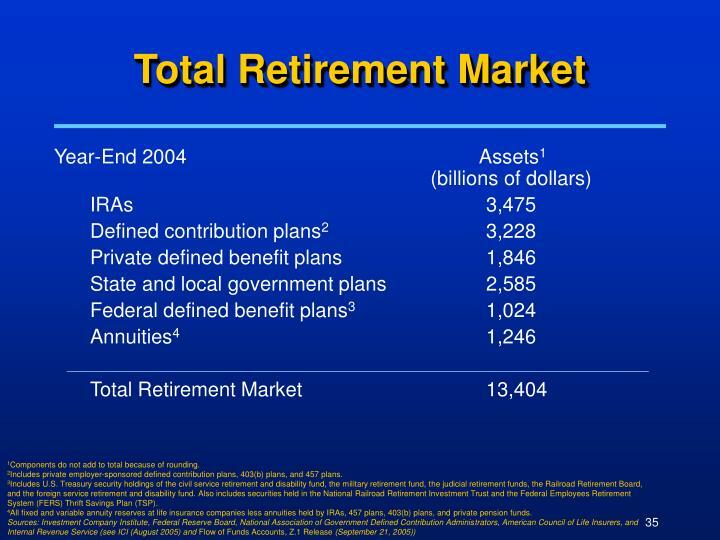 3Includes U.S. Treasury security holdings of the civil service retirement and disability fund, the military retirement fund, the judicial retirement funds, the Railroad Retirement Board, and the foreign service retirement and disability fund. Also includes securities held in the National Railroad Retirement Investment Trust and the Federal Employees Retirement System (FERS) Thrift Savings Plan (TSP). 4All fixed and variable annuity reserves at life insurance companies less annuities held by IRAs, 457 plans, 403(b) plans, and private pension funds. 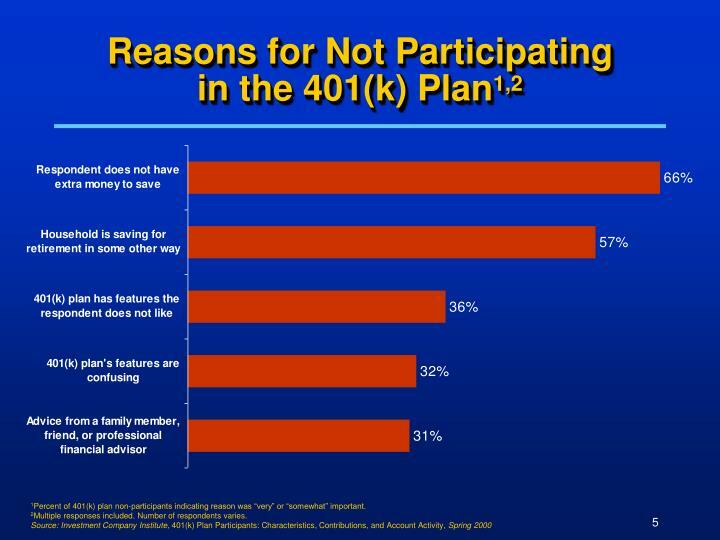 1Percent of 401(k) plan nonparticipants “very” or “somewhat” likely to enroll if each change is made. 1Communication techniques used to accomplish primary education goal. Multiple responses included. 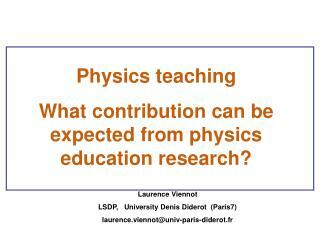 For other types of education mentioned, see the report. 1Percent of total assets. Components may not add to 100 percent because of rounding. 2“Funds” include mutual funds, life insurance separate accounts, bank collective trusts, and any pool of assets primarily invested in the investment objective indicated. 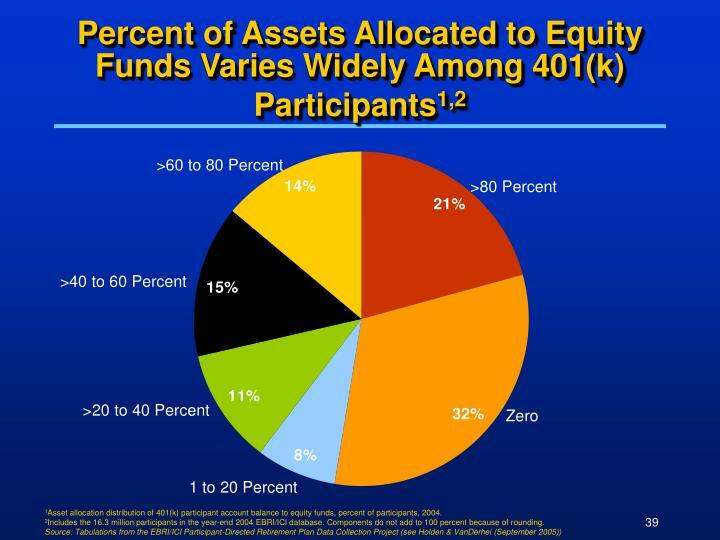 1Asset allocation distribution of 401(k) participant account balance to equity funds, percent of participants, 2004. 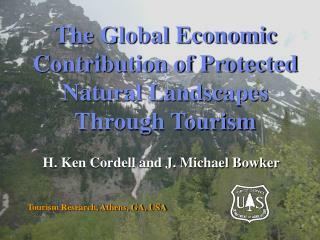 2Includes the 16.3 million participants in the year-end 2004 EBRI/ICI database. Components do not add to 100 percent because of rounding. 2Sample of about 23,500 plans with 1.4 million participants drawn from the year-end 2000 EBRI/ICI database. 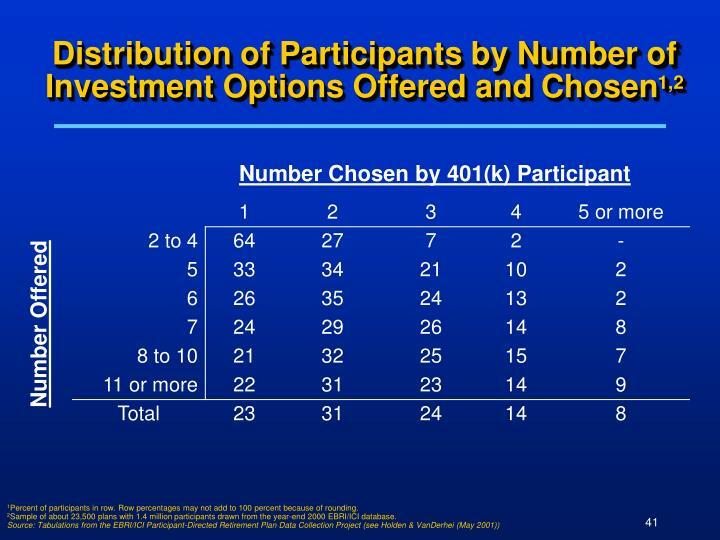 Median number of options offered is 10; average is 10.4. Median number of options chosen is 2; average is 2.5. 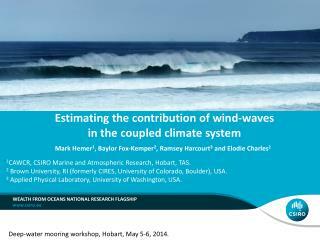 1Percent of participants in row. 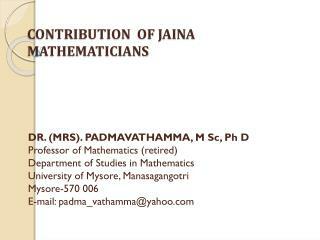 Row percentages may not add to 100 percent because of rounding. 2Sample of about 23,500 plans with 1.4 million participants drawn from the year-end 2000 EBRI/ICI database. 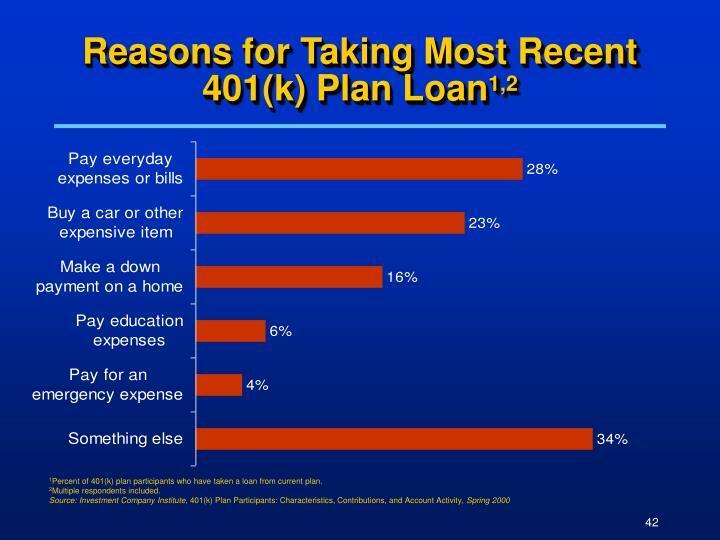 1Percent of 401(k) plan participants who have taken a loan from current plan. 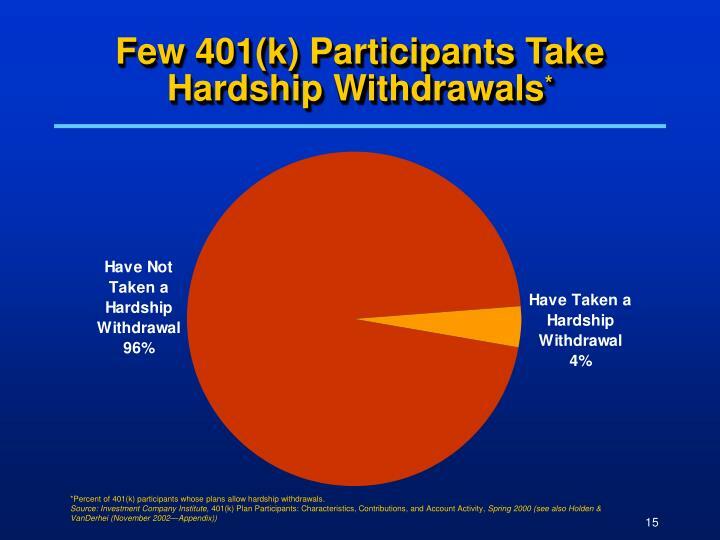 1Percent of 401(k) plan participants who have taken a hardship withdrawal from current plan. 1Percentage of assets in account type indicated. 2Some of the differences in asset type between the two account types is due to the differing format of the question asked across the two account types. 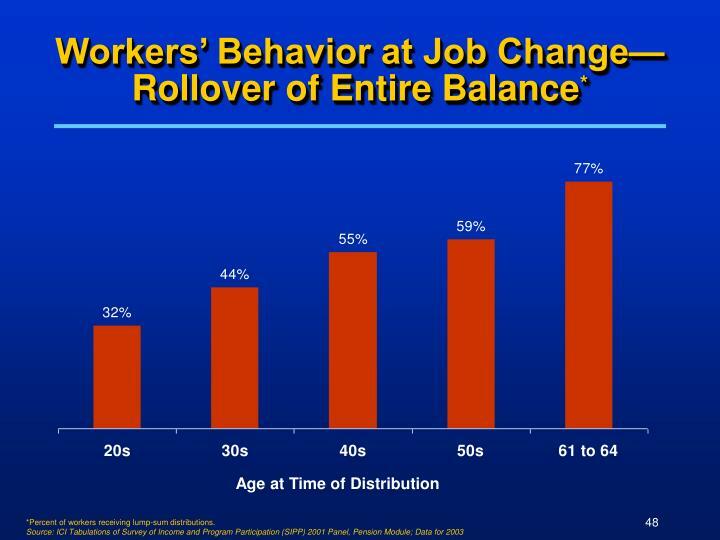 *Percent of workers; percentages do not add to 100 percent because of rounding. 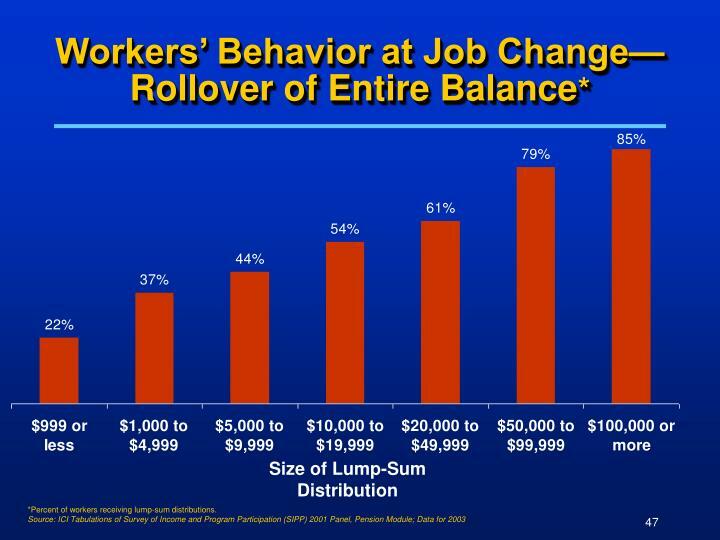 *Percent of workers receiving lump-sum distributions. 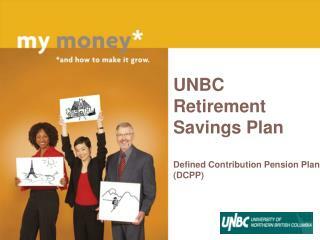 1Individuals retired from a defined contribution plan between 1995 and 2000. Multiple responses included. Data as of May 2000. 2Percent of respondents who had multiple options. Choi, James J., David Laibson, Brigitte C. Madrian, and Andrew Metrick. 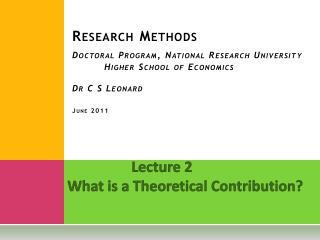 “Saving for Retirement on the Path of Least Resistance,” Originally prepared for Tax policy and the Economy 2001, updated draft July 19, 2004. Copeland, Craig. 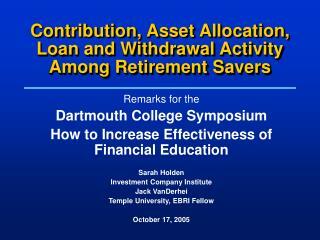 “Retirement Plan Participation and Asset Allocation,” EBRI Notes, Vol. 25, No. 1, Washington, DC: Employee Benefit Research Institute, January 2004: pp. 1-11. Federal Reserve Board. Survey of Consumer Finances, available at: <http://www.federalreserve.gov/pubs/oss/oss2/scfindex.html>. Federal Reserve Board. Flow of Funds Accounts of the United States, Z.1 Release. 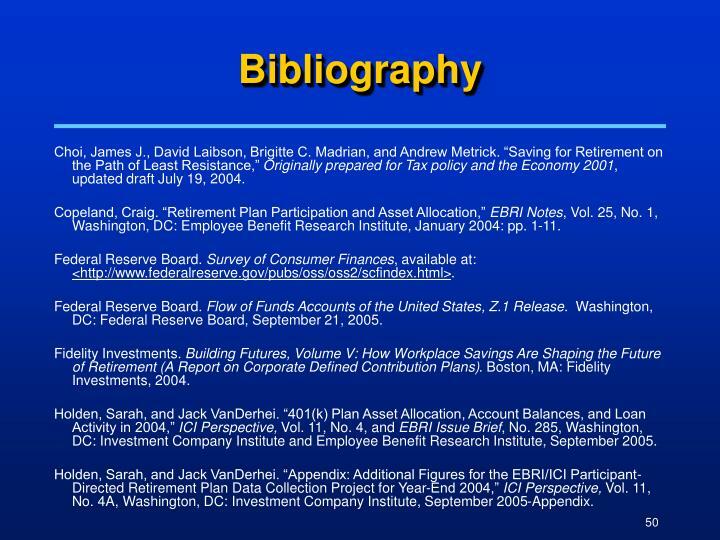 Washington, DC: Federal Reserve Board, September 21, 2005. Fidelity Investments. Building Futures, Volume V: How Workplace Savings Are Shaping the Future of Retirement (A Report on Corporate Defined Contribution Plans). Boston, MA: Fidelity Investments, 2004. Holden, Sarah, and Jack VanDerhei. 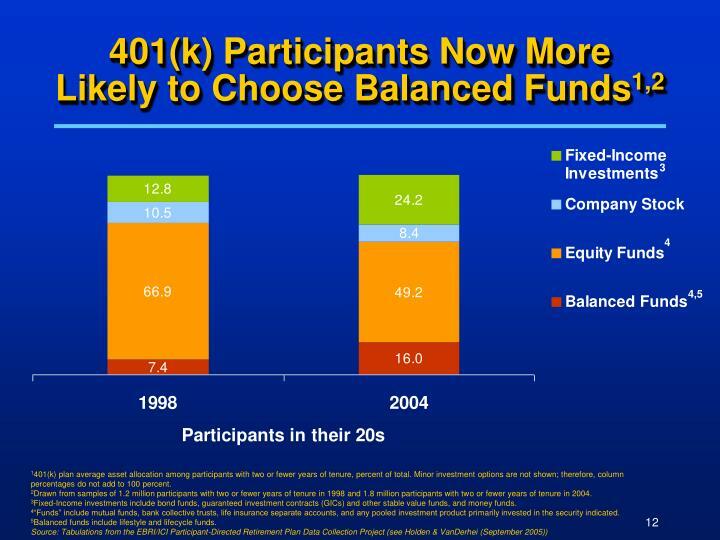 “401(k) Plan Asset Allocation, Account Balances, and Loan Activity in 2004,” ICI Perspective, Vol. 11, No. 4, and EBRI Issue Brief, No. 285, Washington, DC: Investment Company Institute and Employee Benefit Research Institute, September 2005. Holden, Sarah, and Jack VanDerhei. 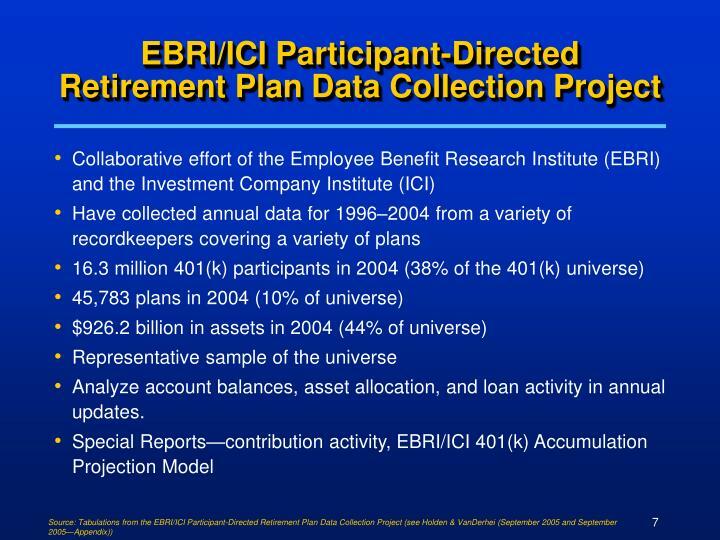 “Appendix: Additional Figures for the EBRI/ICI Participant-Directed Retirement Plan Data Collection Project for Year-End 2004,” ICI Perspective, Vol. 11, No. 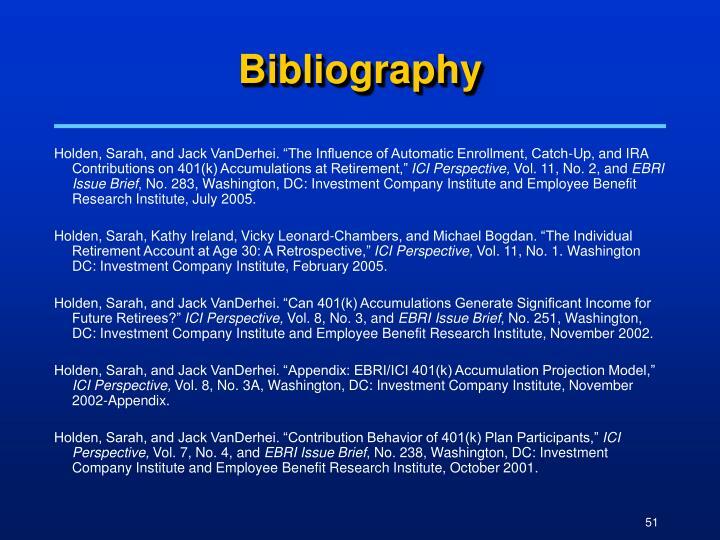 4A, Washington, DC: Investment Company Institute, September 2005-Appendix. Holden, Sarah, and Jack VanDerhei. 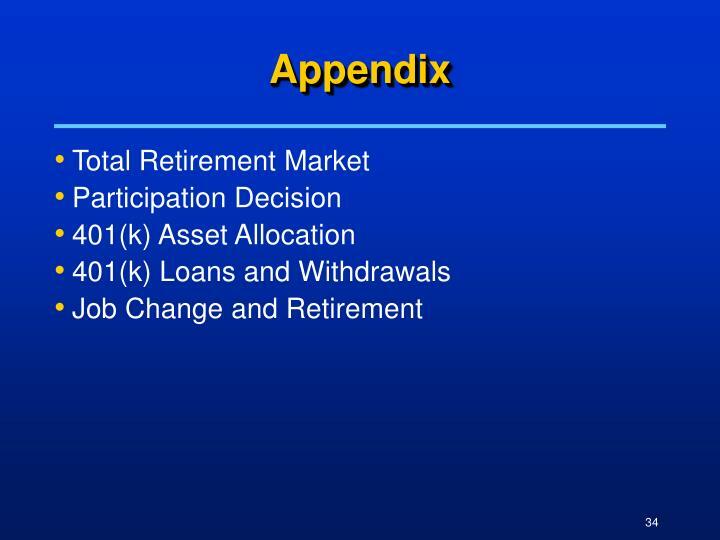 “The Influence of Automatic Enrollment, Catch-Up, and IRA Contributions on 401(k) Accumulations at Retirement,” ICI Perspective, Vol. 11, No. 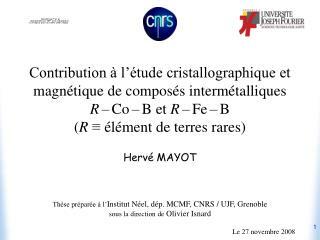 2, and EBRI Issue Brief, No. 283, Washington, DC: Investment Company Institute and Employee Benefit Research Institute, July 2005. Holden, Sarah, Kathy Ireland, Vicky Leonard-Chambers, and Michael Bogdan. “The Individual Retirement Account at Age 30: A Retrospective,” ICI Perspective, Vol. 11, No. 1. Washington DC: Investment Company Institute, February 2005. Holden, Sarah, and Jack VanDerhei. 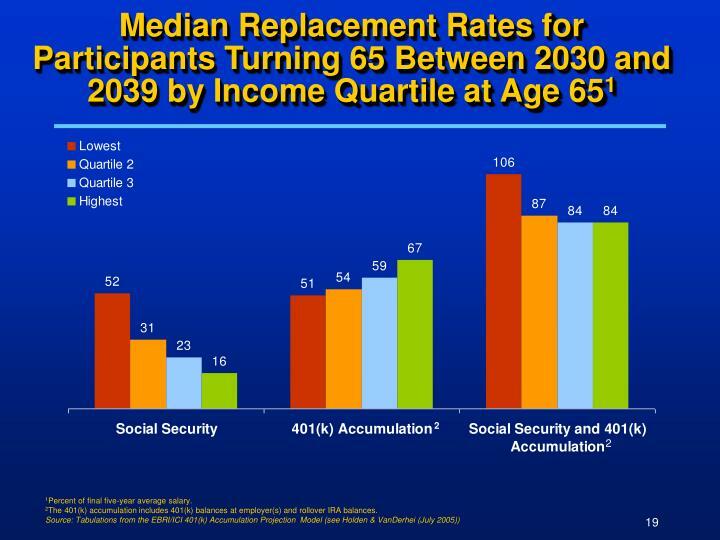 “Can 401(k) Accumulations Generate Significant Income for Future Retirees?” ICI Perspective, Vol. 8, No. 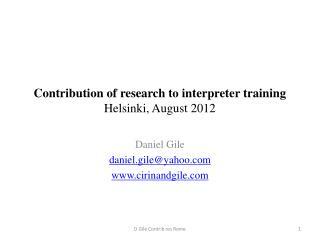 3, and EBRI Issue Brief, No. 251, Washington, DC: Investment Company Institute and Employee Benefit Research Institute, November 2002. Holden, Sarah, and Jack VanDerhei. 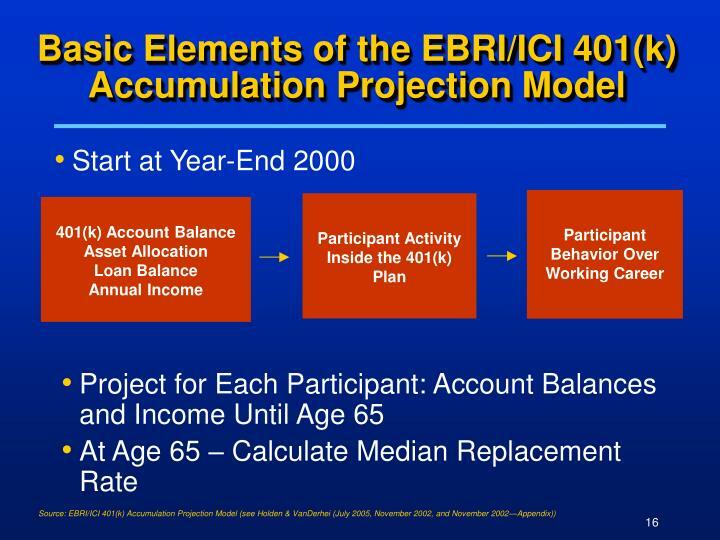 “Appendix: EBRI/ICI 401(k) Accumulation Projection Model,” ICI Perspective, Vol. 8, No. 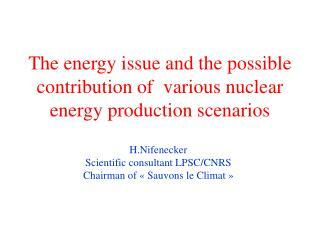 3A, Washington, DC: Investment Company Institute, November 2002-Appendix. Holden, Sarah, and Jack VanDerhei. 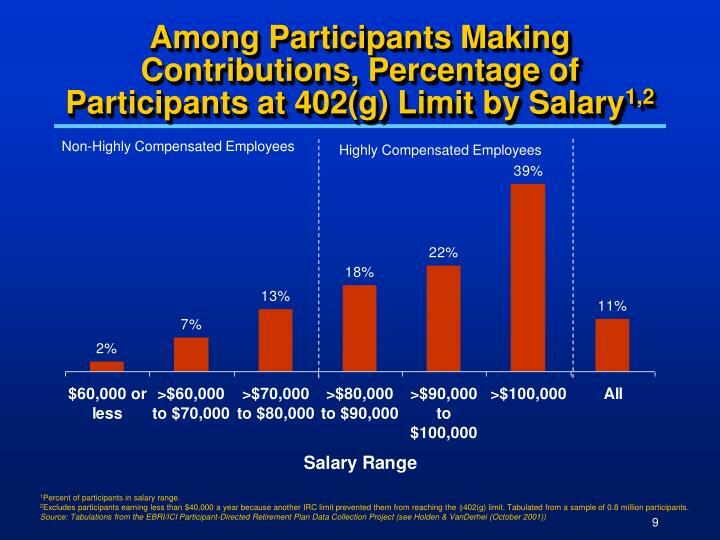 “Contribution Behavior of 401(k) Plan Participants,” ICI Perspective, Vol. 7, No. 4, and EBRI Issue Brief, No. 238, Washington, DC: Investment Company Institute and Employee Benefit Research Institute, October 2001. Holden, Sarah, and Jack VanDerhei. “The Impact of Employer-Selected Investment Options on 401(k) Plan Participants’ Asset Allocations: Preliminary Findings,” Working Paper prepared for The Center for Pension and Retirement Research (CPRR) Current Pension Policy Issues Conference, at Miami University, Oxford, OH, June 8-9, 2001: Draft, May 2001. Investment Company Institute. “Mutual Funds and the U.S. Retirement Market in 2004,” ICI Fundamentals, Vol. 14, No. 4, Washington, DC: Investment Company Institute, August 2005. Investment Company Institute. “Appendix: Additional Data on Mutual Funds and the U.S. Retirement Market in 2004,” ICI Fundamentals, Vol. 14, No. 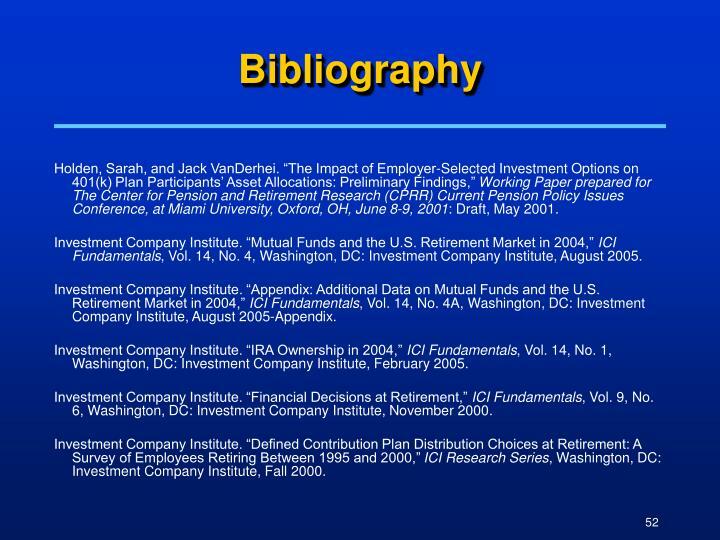 4A, Washington, DC: Investment Company Institute, August 2005-Appendix. Investment Company Institute. 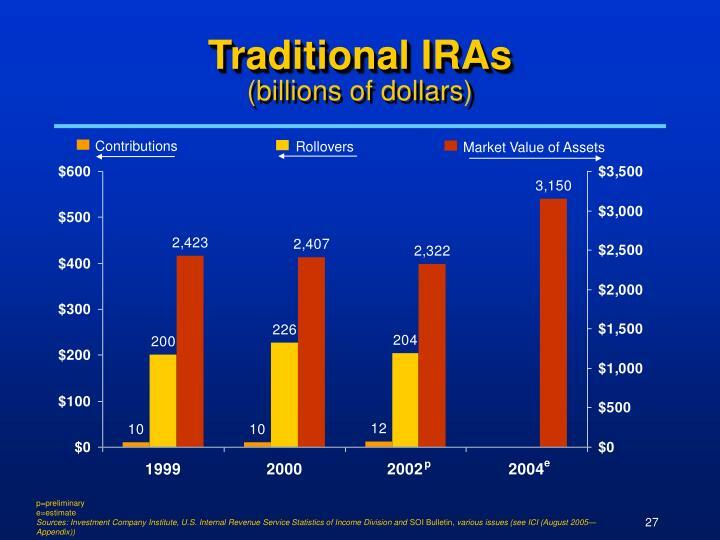 “IRA Ownership in 2004,” ICI Fundamentals, Vol. 14, No. 1, Washington, DC: Investment Company Institute, February 2005. Investment Company Institute. 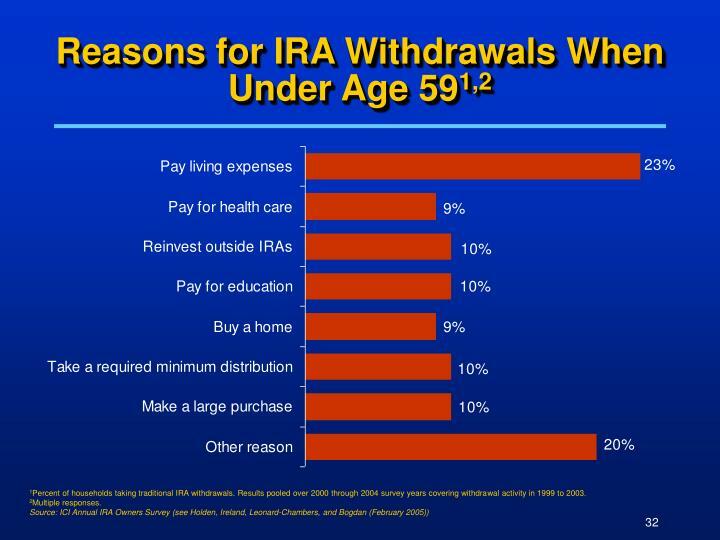 “Financial Decisions at Retirement,” ICI Fundamentals, Vol. 9, No. 6, Washington, DC: Investment Company Institute, November 2000. Investment Company Institute. 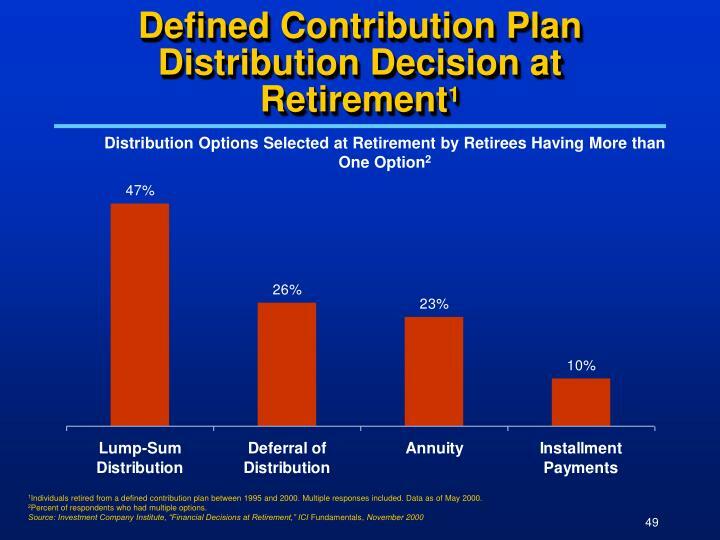 “Defined Contribution Plan Distribution Choices at Retirement: A Survey of Employees Retiring Between 1995 and 2000,” ICI Research Series, Washington, DC: Investment Company Institute, Fall 2000. Investment Company Institute. 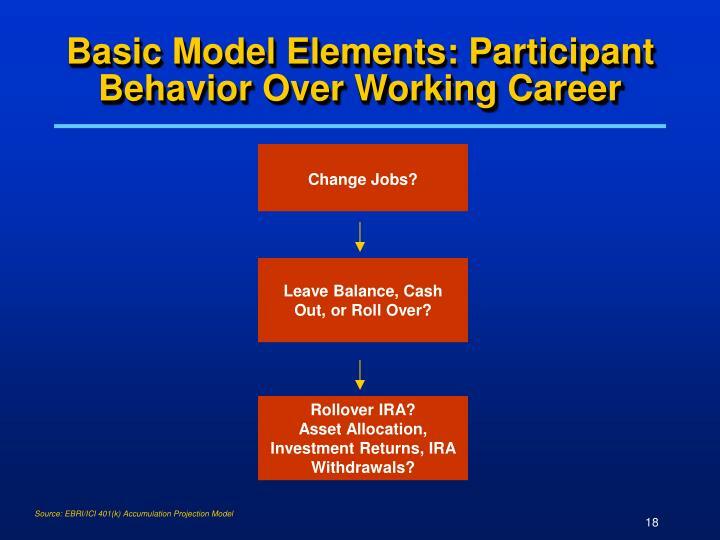 “401(k) Plan Participants: Characteristics, Contributions, and Account Activity,” ICI Research Series, Washington, DC: Investment Company Institute, Spring 2000. 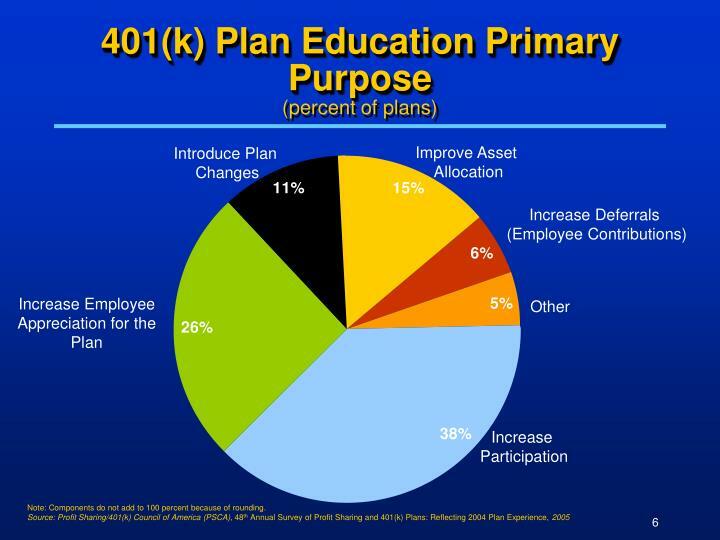 Profit Sharing/401(k) Council of America (PSCA). 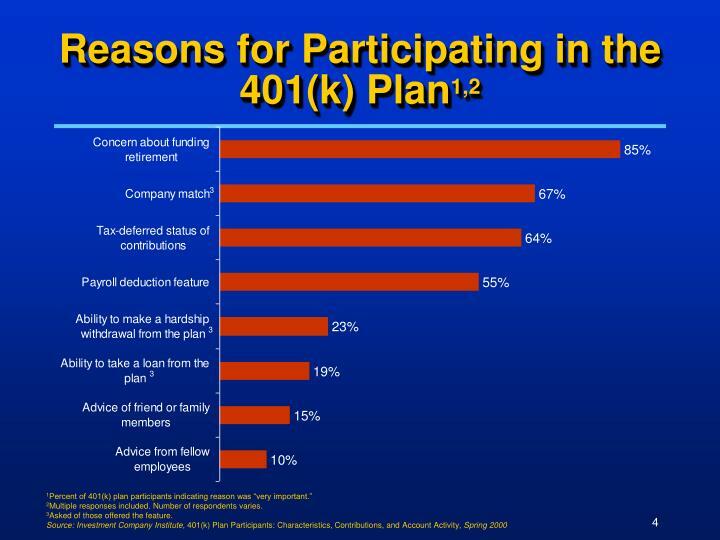 48th Annual Survey of Profit Sharing and 401(k) Plans: Reflecting 2004 Plan Experience. 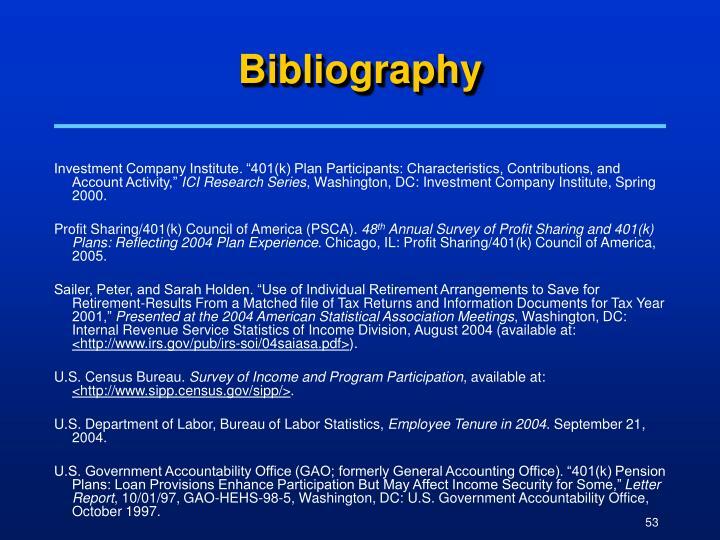 Chicago, IL: Profit Sharing/401(k) Council of America, 2005. Sailer, Peter, and Sarah Holden. 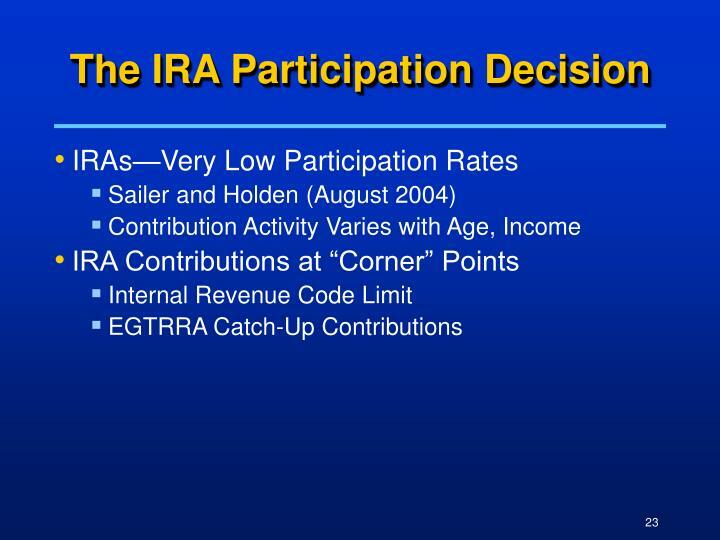 “Use of Individual Retirement Arrangements to Save for Retirement-Results From a Matched file of Tax Returns and Information Documents for Tax Year 2001,” Presented at the 2004 American Statistical Association Meetings, Washington, DC: Internal Revenue Service Statistics of Income Division, August 2004 (available at: <http://www.irs.gov/pub/irs-soi/04saiasa.pdf>). U.S. Census Bureau. Survey of Income and Program Participation, available at: <http://www.sipp.census.gov/sipp/>. 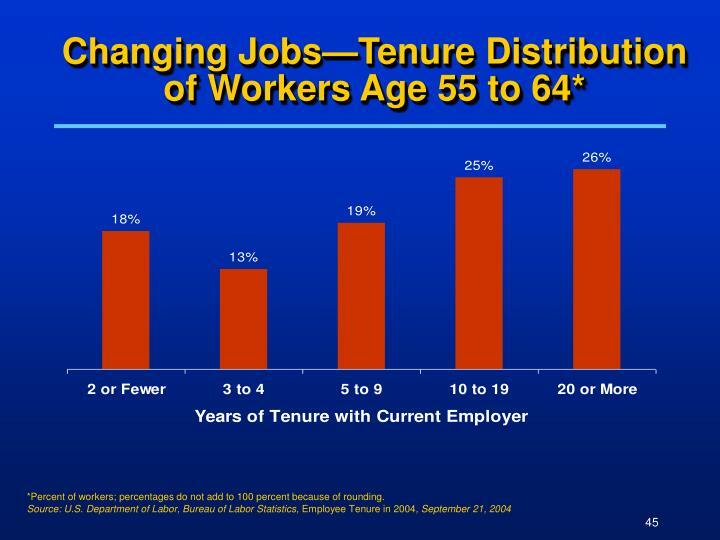 U.S. Department of Labor, Bureau of Labor Statistics, Employee Tenure in 2004. September 21, 2004. 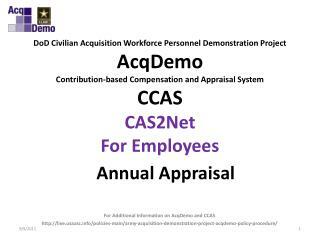 U.S. Government Accountability Office (GAO; formerly General Accounting Office). 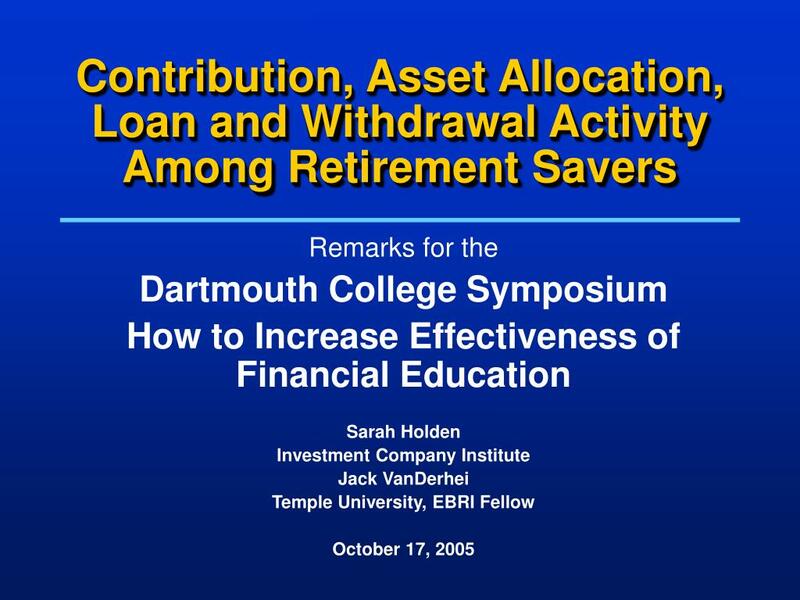 “401(k) Pension Plans: Loan Provisions Enhance Participation But May Affect Income Security for Some,” Letter Report, 10/01/97, GAO-HEHS-98-5, Washington, DC: U.S. Government Accountability Office, October 1997. 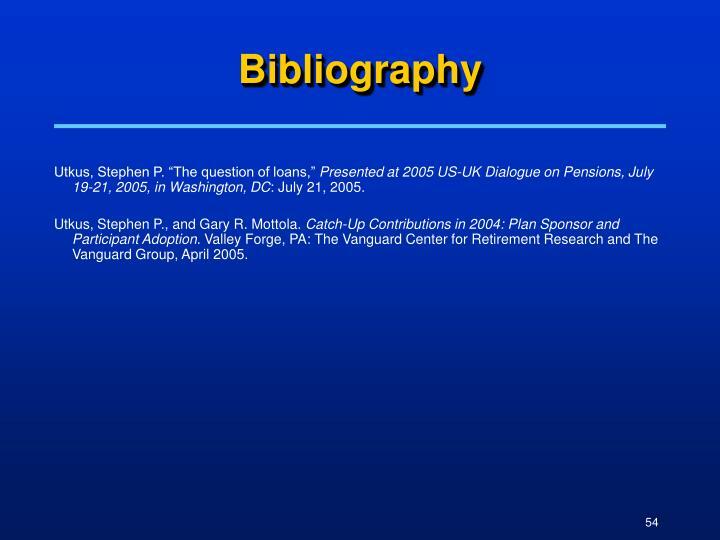 Utkus, Stephen P. “The question of loans,” Presented at 2005 US-UK Dialogue on Pensions, July 19-21, 2005, in Washington, DC: July 21, 2005. Utkus, Stephen P., and Gary R. Mottola. 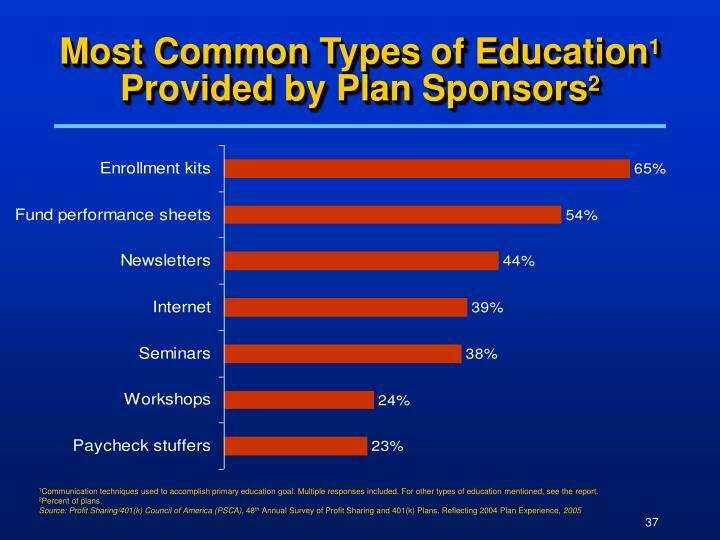 Catch-Up Contributions in 2004: Plan Sponsor and Participant Adoption. Valley Forge, PA: The Vanguard Center for Retirement Research and The Vanguard Group, April 2005. 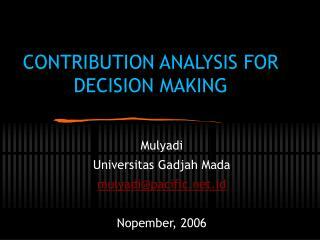 CONTRIBUTION ANALYSIS FOR DECISION MAKING -. mulyadi universitas gadjah mada mulyadi@pacific.net.id nopember, 2006. butir-butir penting. 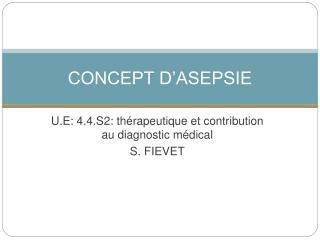 introduction identifying relevant costs applying differential analysis best use of limited resources. 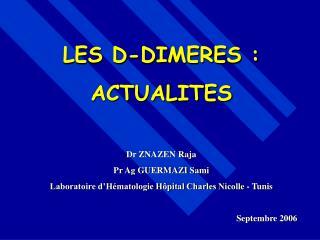 INTRODUCTION -Les d-dimeres : actualites dr znazen raja pr ag guermazi sami laboratoire d’hématologie hôpital charles nicolle - tunis septembre 2006.